Quick, let's checkout this girl before Angelina spies her! One of the most irksome critiques offered about a movie is that “it was different from the book.” Film adaptations that faithfully regurgitate their literary sources are often stunted by their slavish adherence to substance over style instead of taking the reasonable and necessary step of retooling both content and presentation for a different medium. 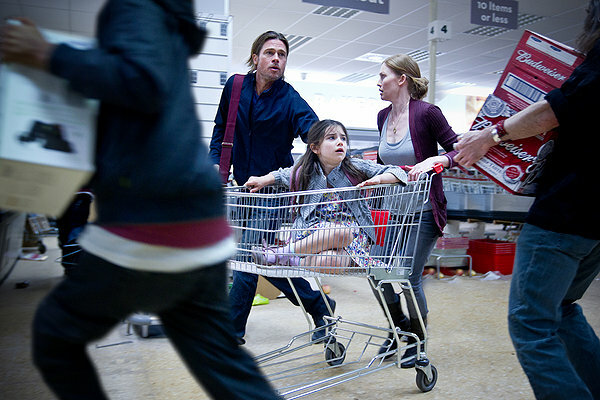 That said, every so often comes a film like World War Z, whose thematic soul wilts in the summer movie heat. Max Brooks’ popular 2006 book of the same name provides an oral history of mankind’s fight against a pandemic zombie outbreak. Told from multiple rotating perspectives, the book uses the war against a zombie plague as a springboard for exploring the particular geo-political, cultural, religious and environmental obstacles that complicate fighting the war. It’s a film adaptation that screams out for the sort of interconnected, multi-narrative format employed by Steven Soderbergh in Traffic, Paul Haggis in Crash, and especially Alejandro González Iñárritu’s Babel. It’s this sort of fact-based fiction that is the tantalizing hallmark of Brooks’ novel but goes missing in the Hollywood movie that instead opts for the Hollywood star. Pitt’s character is the film’s focal point, globetrotting from the United States to Asia to Jerusalem to peruse the pandemic and its source. In actuality, Lane leaps from one dark corridor to another, with the unending undead serving as fear-fodder. Many have probably confused Philadelphia during rush hour with a zombie scourge, but here Lane and his nuclear family experience the real thing before helicoptering to the safety of an offshore military aircraft carrier. Lane’s wife and kids can keep their bunks if Lane reenlists to help random government agencies figure out what is going on and why. The film effectively reminds us of the precarious tapestry of our social fabric—pushed to extremes, the mob trumps all our semblances of security. There are some nail-biting scenes, including when the zombie horde figures out how to scale en masse a giant wall Israel quickly erected around Jerusalem at the first far-off hint of an undead uprising—why and how they were able to do this is a question asked and never answered. And the Hobson’s choice Lane faces once passengers aboard his commercial airliner rapidly morph into zombies midflight is the highlight of the film. But while any nuance was left on the page, World War Z poses a new set of replacement puzzlers, such as why Lane (bad haircut and all) is so indispensable to rooting out the cause(s) of the plague (somebody mentions his involvement with the Liberian Civil War and Second Chechen War, whatever that’s worth). And I’m still trying to figure out why Lane’s ultimate solution to winning the Zombie War isn’t just an alternate pathway to human extinction. While the zombies of World War Z are the 28 Days Later variety of snarling sprinters, this new film doesn’t share any of the social and political commentary in Danny Boyle’s genre remake or, for that matter, Shaun of the Dead, AMC’s The Walking Dead, and the indomitable oeuvre of George Romero. If World War Zzzzz were all PG-13 spectacle, at least it might be a suitable summer blockbuster. Instead, it’s also a zombified bore full of cheap chills and tired tropes.